← Hurry! See the Hanging Nasturtiums at the Gardner Museum Before It’s Too Late! The Colonial Garden Club of Hollis was treated to a lively presentation by gardening expert C.L. Fornari on ways to keep your garden from driving you crazy by making smart decisions about plant choices, placement, and care. C.L. is known as the Gardening Lady and is host of Gardenline that is streamed online through WXTK radio out of Cape Cod. 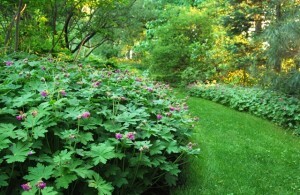 She consults on landscaping on Cape Cod as well as garden weddings throughout the Northeast. 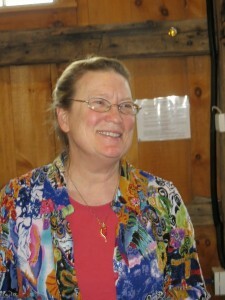 She has written several highly regarded books on Cape Cod gardens and presents frequently to a wide variety of groups. Her website www.GardenLady.com provides more information on her services as well as gardening advice. C.L. started the talk with how difficult it can be to help someone about a plant problem when it’s not clear what the plant is. She had a woman ask about her Japanese fern that was very tall. The ferns C.L. had were not tall, so she didn’t know what the customer was talking about. However, later through another customer, she realized the woman was referring to the FernLeaf Japanese Maple that can grow to 8 feet and whose leaves turn orange or red in the fall. What a difference a few words can make. If you don’t know the name of your plant, bringing a photo would help. Keep in mind that an informal garden that has a mix of perennials, shrubs, and trees allows you to easily replace a plant that has died whereas a formal knot garden will look odd when a boxwood dies. 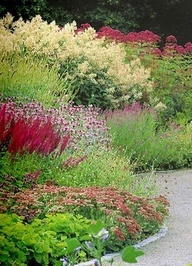 The new American Garden style that is popular now is a combination of perennials, annuals, vegetables, and shrubs. Be careful of plants that can take over a garden such as ribbon grass. One indication of a plant that will be dominant is if its roots are growing out of the bottom of the pot when you buy it. It’s okay to have them as long as they are in a container in the garden or on the deck. Don’t plant perennials in clay pots because they crack when the bottom of the container, which is on the ground, is cool while the upper part is warm from the sun. Place the pot on three little blocks of wood in the winter so it is off the ground. The plants in pots need to be hardy two zones colder than where you are (so if you are in Zone 5, the plant needs to be hardy in Zone 3). If it’s not hardy in two zones colder, store in the garage or basement in winter. Only put soil in pots – no rocks or shards on the bottom! That’s a habit I don’t seem to be able to kick. Be sure to make a map of your bulbs so in the fall you’ll know where to plant the muscari and grape hyacinth so it comes up next to the daffodils in the spring. For example, plant hosta, which break dormancy only when it’s warm, near daffodils which come up early in spring. The hosta foliage hides the drooping leaves of the daffodils when the daffodils are done blooming. Match the plants to the soil conditions. For example, if your soil is shallow and dry, try planting succulents. For a flower garden, try including weed smothering plants, such as Hakonachloa macra, Aster divaricatus, and Geranium macrorrhizum, which is also deer-resistant. 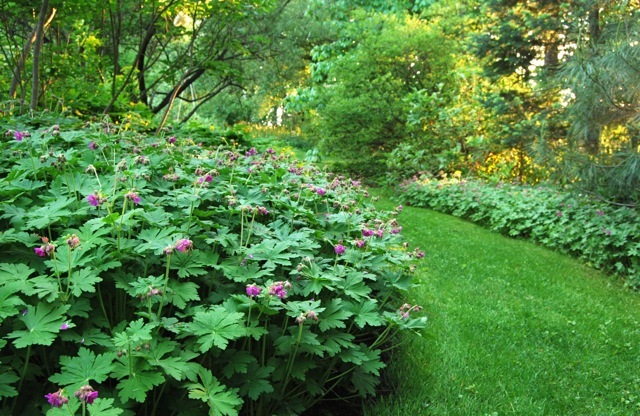 Plants for wet places include Juncus effuses, variegated red twig dogwood, and Primula japonica. For dry places, try Coreopsis ‘Zagreb’, Achillia ‘Pineapple Mango’, and Pysocarpus ‘Summer Wine.’ These can tolerate up to six weeks without rain or watering. 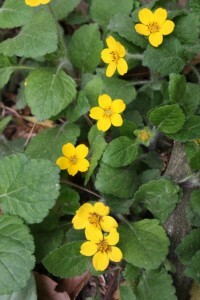 An effective ground cover, which is also good in wet places, is Green-and-Gold chrysogonum with star-shaped yellow flowers. 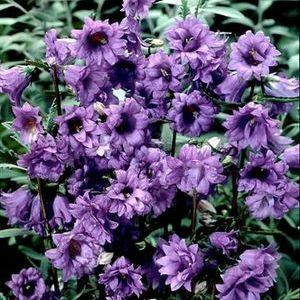 For a cutting garden, include the perennial campanula bernice and dianthus barbatus (sweet william) along with dahlias, asters, and zinnias. Also consider lysimachia punctate, also known as yellow loosestrife and circle flower. For screening, the tendency is to use arborvitae. The problem is when one of the arborvitae dies and you have to replace it. The arborvitae are then no longer the same size. A better solution is to have a variety of plants as a screen so when you have to replace one, it’s not so noticeable. Sometimes doing too much can actually hurt instead of help. When planting a new tree, you want it to have the best start and so you heavily amend soil in the area around the tree. However, this can cause the area around the tree to sink. This is because the tree wants its roots to stay in the enriched soil rather than spread, causing it to have a reduced root system. Instead, when planting a tree, make the hole only as deep as the ball of the tree and put the original soil back in place. You can place organic matter on the top surface to amend the soil from the top down. When staking a new tree, only leave the support on for the first year. To leave it on longer denies the tree the ability to stand in the wind. It’s the movement of wind that helps a tree to create a strong root system. Roots grow in the top twelve inches of soil and grow out horizontally. 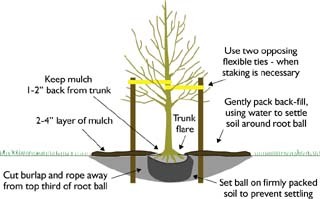 Also, remove any rope, wire baskets, or burlap around the base of the tree or root ball. Otherwise, they can strangle the tree. Burlap is generally treated with copper so it doesn’t break down. Do not attempt to control plant growth – let plants find their way as they do in nature. To avoid weeds, plant thickly. Automatic irrigation systems often waste water because they come on at the wrong times such as when it’s raining. This can cause lawn disease. Instead, use a manual system and a rain gauge. If the area gets one inch of rain in a week, don’t water. Otherwise, use the irrigation system. Be sure to check the rain gauge frequently. Best location for hydrangeas is where it gets morning sum and afternoon shade. Mulch helps to retains moisture. Hydrangeas lose moisture in the sun causing the big leaves and flowers to flop; but if they recover by dusk, they’re fine. Otherwise, water as needed. When pruning, cut dead wood only. To control voles, use a regulation mouse trap baited with potato. For Japanese beetles, make up a concoction of hot pepper wax or cayenne with cloves of raw garlic and strain it. Spray it on plants before there’s a beetle problem. Irrigation systems can aggravate the problem because of the damp soil. For powdery mildew on peonies, minaria, and phlox, cut the plants to the ground. Leaf spot doesn’t kill; water in the morning, once a week. Cut down peonies in August and plant the annual snow alyssum, which blossoms from mid- summer through the fall and spreads to cover a wide area.